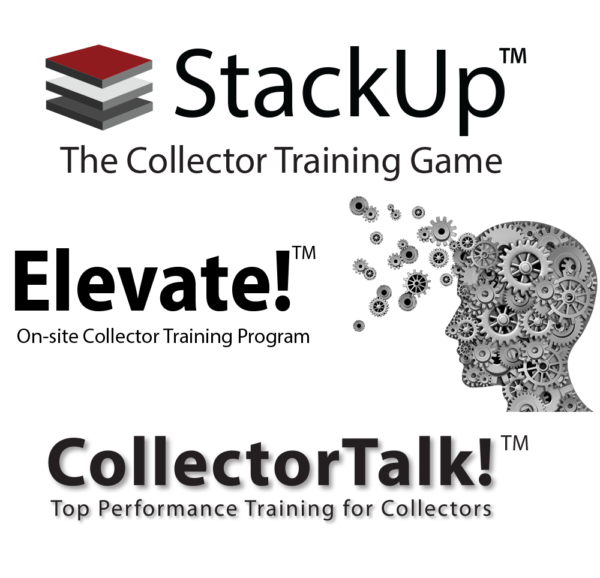 The Intelitech Group currently offers three different solutions to help keep your collectors at their best: StackUp™, Elevate!™, and CollectorTalk!™. These solutions were designed to not only keep your collectors informed about the latest collection methods, regulations and standards, but to also keep them engaged by applying and practicing the concepts they are taught. Our solutions provide training for your collectors to be able to collect more dollars on accounts while keeping your company compliant. In an ever changing industry, we’ll be able to help keep your collectors informed on the latest policies and procedures, as well as improve their communication skills through live onsite trainings. We also provide activities your collectors can do every day to keep their skills sharp. We offer a variety of training methods to improve your collector’s communication skills, both onsite training (live training at your location), as well as exercises your staff can do every day at their work stations – reinforcing proven practices in order to recover more revenue. Train your collectors to be prepared with the latest information from the following industry regulators: CFPB, FDCPA, FCRA, HIPAA, TCPA, and GBLA. We’ll introduce you to a new way to learn these concepts through a fun, interactive, and motivating manner. Take out the guess work and create the optimal work environment by making appropriate adjustments based off of your staff’s recovery ability. Through automated reports and analytics, you’ll not only be able to identify your strengths and weaknesses as a company, but also see how you compare to other recovery organizations in the industry. StackUp is a great way to keep current collection techniques, news, and laws in the forefront of our financial counselor’s mindset while doing the daily tasks of the collection industry. I appreciate the way the site is set up and its’ competitive and fun nature. The eight categories provide a clear understanding of where additional training is needed for my staff. StackUp is a great way to help my staff stay focused on doing the right thing. I highly recommend StackUp as a training tool. StackUp allows us to continuously focus on compliance while still keeping it fun and competitive. We all know that the best way to learn is repetition, and by answering our StackUp questions each day, the repetition of questions and answers helps our agency maintain compliance with all the regulations.